After the death of his parents, Danny Lansing moves in with his Uncle Angus. He's quickly thrown into a dark and dangerous world of guns and high speed chases, after his uncle uncovers an arms-shipping organisation. 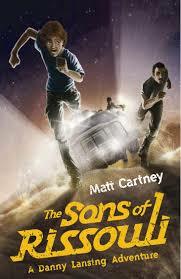 Accompanying Angus to North Africa to investigate, Danny finds himself in mortal peril - can he save the day? In many ways, this is reminiscent of classic adventure stories from the early 20th century. If Biggles author WE Johns was still alive, this is one of the books I'd definitely recommend to him - it captures the same spirit of adventure and pluck that his own novels do. That said, it's a modern take on things. That's not to say it's old fashioned - investigative journalist Angus is a modern hero, and it's fast-paced and exciting enough to hold its own against other similar thrillers. It's refreshingly slim, as well. Due to the pace it still packs a lot of action into it, and there's something quite impressive about a book which weighs in at significantly less than 200 pages but still manages to tell a compelling story, with a decent ending, and leaves the readers wanting more. At a time when more and more adventure stories seem to be becoming rather bloated, a quick but satisfying read is always welcome. As much as I liked both Danny and Angus, I did wish they had a bit more characterisation (although I appreciate that the strong focus on the action rather than masses of character development helped to keep the book down in length.) That's a relatively minor complaint, though - this is one I'm very happy to recommend, and I look forward to reading the next in the series, Red, White and Black.